Specific Industry: Platform for professional corporate services in Cyprus, supporting investment strategies to the European Union and wider EMEA region. 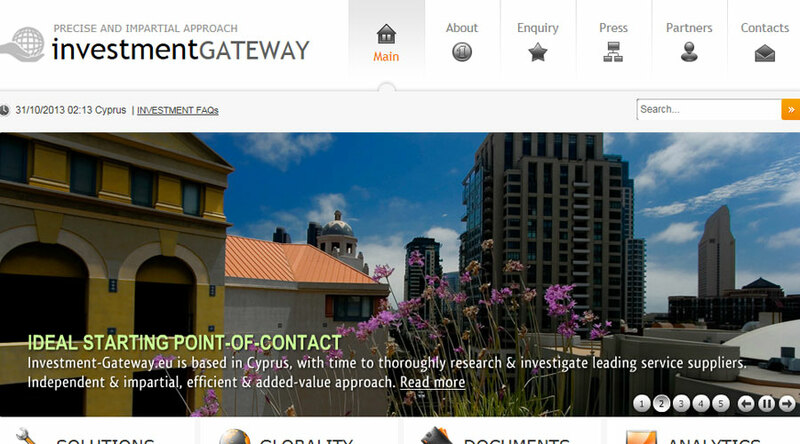 Established in 2011, Investment-Gateway.eu is an independent online platform and forum of information exchange for professional services via Cyprus and the European Union. Investment Gateway provides a fresh and dynamic online added-value tool that goes a step further, offering an evident, fast and free service. Essentially, Investment Gateway introduces potential clients - international companies, organisations and individuals - to leading partner agents in Cyprus for conducting professional services. Core activities these agents offer are in legal, accounting and consulting for investment purposes and financial services. The professional services sector is by far the most competitive in the Cyprus market (representing the bulk of national GDP contribution), and quite competitive globally. After working with Web-Conceptions this website managed to achieve excellent search engine ranking in only a very short space of time, both in the Cyprus market and globally. Web-Conceptions provided a complete website solution, including initial consulting, planning and benchmarking; online business strategy; web design concept with programming development; extensive elements of Content Management System (CMS) for updating content; industry and market content research & writing, editing; SEO analysis and implementation; online and Internet marketing business strategy and presence, including social media work; tracking & monitoring; website hosting service and maintenance. Focus for this project was to deliver a fully functional and robust platform for promoting professional services in Cyprus and encouraging investments to the wider EMEA region. The website's main goal was to be informative, easy to navigate and achieve very good web presence and search engine ranking in order to reach out to a larger audience and boost its ability to find new partners and clients. As such, it was the overall positioning and concept of the website, together with its content base and external exposure, i.e. partnerships, information and links on third party websites, that most focus was needed. A complete digital strategy that required in-depth and thorough industry and market research, including benchmarking, SEO analysis, detailed copywriting, a number of new SEO strategies, as well as on-going digital marketing and online PR work. Like other Web-Conception's website projects, crucial elements of this site were in static content in order to achieve a favourable search engine ranking, as well as a fully customised CMS to allow for regular postings of new content. Content and SEO: when it comes to search engine optimisation (SEO), it is well known that content is King. This site needed to excel in content and prioritise certain key words and phrases that target customers were searching. Indeed it did, and SEO results were seen almost immediately. Prior to any copywriting, a detailed analysis on the professional services in Cyprus industry and target markets needed to be done. At the same time, brainstorming with the client to clarify overall business strategy and corporate goals, hence determining high-priority key words and phrases. After which, comprehensive and meticulous website content copywriting and editing. This includes ongoing copy work, ensuring search ranking is not only maintained, but improves. At the same time, Web-Conceptions provided link-building services, as well as external online PR. Together, this created powerful online presence and helped drive website traffic, enquiries and conversions. CMS: maintaining certain aspects of website content is crucial to maintaining long-term online presence and search engine ranking, as well as for providing added-value content to visitors. This meant a great deal of dynamic website content, including news and press releases, interviews, blog (feature report), analysis of market and macro economical trends and indicators, as well as documents and publications. Each of these CMS sections also incorporates its own elements of Search Engine Optimisation (SEO) and digital marketing, i.e. adopting meta tags and integration with social media.